Recently I decided to daily switch my main computer off. This computer was usually on all time, and consume a lot of electricity. So, I switched to a really small computer for common task: ssh-server, wake on lan (for my main computer), VPN access and mail relay. This new computer consume 7watts but his specs are : Geode CPU at 300Mhz, 128Mb of RAM, and 40Go of HD. Yes, that’s really low, but far enough for attributed tasks. I randomly log on this for external to access all computer inside my home network. 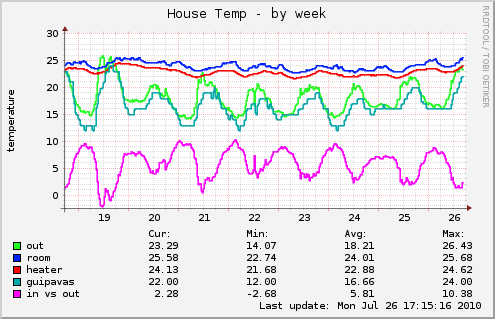 As you can see on this graph, I use a reference temperature from Guipavas. This stuff is public, and I use the Weather.com for the info. All works fine for about an year now. But when I switched to my new little box (300Mhz..) the python script used to monitor the 1wire network and gather weather.com reference was a bit heavier than excepted for this little box. I first thought to rewrite this in pure C, but having to deal w/ xml parsing (libxml) and Posix serial in C .. That’s the little story, I decided to rewrite this script (and other) in Vala. I will not dump the Vala introduction here, but to be short it’s a new language that produce C used by Gnome Desktop. The syntax tend to be a C# like, and it has a lot of libraries and doesn’t need the bloat of an interpreter (nor VM). My first test was to listen to the Arduino serial port. I used a Serial.vala wrapper found on the net, this is simple and neat. Just added some string parsing, and I get my Arduino 1wire network working w/ Vala .. The next is the Weather.com parsing which will be covered in a future post. To conclude, the Vala result is fine. The result binary is small 38KB, it has quite a lot of dependencies (libsoup,glib, pthread, gobject..) and consume more memory than my python script. Python interpreter + Elementtree (xml parsing) + pyserial eat around 8.9MB of RAM, while the my Vala code eat 12.3MB. But keep in mind that’s this is with all the shared libraries. So, if you use a couple of script like me, this memory isn’t a big deal, because it will be used across different process without any overhead. I get it, this system has a really small CPU and importing libs from harddrive takes times .. which doesn’t occur with my Vala code, the binary is small, and all dependency are already loaded by the OS itself. To conclude, Python is still my favorite language but running python script on small system has an overhead which I must take care, and avoiding loading / unloading libs is the key. A single python process, with some script loaded will be a better choice. And for small custom apps used on this kind of system, Vala seems to be a good alternative. This entry was posted in Electronics and tagged 1wire, arduino, munin, Python, vala by admin. Bookmark the permalink. Sorry for commenting on an old post, but I’m looking for a simple serial library for Vala, and even I found useful the way the program moserial uses the posix library, I wanted to try the one you’re using here, it could be nice if you can provide some link or reference to that library you used, because I’ve looked in the internet but i didn’t find it.